Revised plans for the "Great Road Marketplace" (AKA Bedford Shopping Center) include a Greenway and a Restaurant with outdoor seating along The Great Road. This artist depiction is viewed from across Great Road. Please note the design is still preliminary. Click on the image for a larger more detailed view. After getting some initial feedback from the Town and Bedford Residents, Salvatore Capital Partners made some changes to the plans for the Bedford Shopping Center now known as Great Road Marketplace (please note these plans are still preliminary and subject to change). At the initial meeting back in November, much of the feedback was on making the shopping center more friendly to pedestrians. Many people also liked the current design at the front of the shopping center (where you have Luigi's and Bank of America on one side and the Post Office and Lemon Tree Cafe on the other) in that they would frequently run in to people they know, almost making it the unofficial town center. The first set of plans had 5 rows of parking in this area. The new version still has a lot of the parking up front, but now has a Walkway with Trees and Grass along the center that extends from The Great Road to near Marshalls and Whole Foods. Plans also include benches and bike racks. Salvatore Capital Partners referred to this as "The Greenway". Please see the image below. This is the area that appear to have the most improvements. In it's place is a 'Greenway' that stretches from Great Road all the way down to Marshall. It is supposed to include benches, an open area and maybe even some food vendors like an Ice Cream cart in summer. 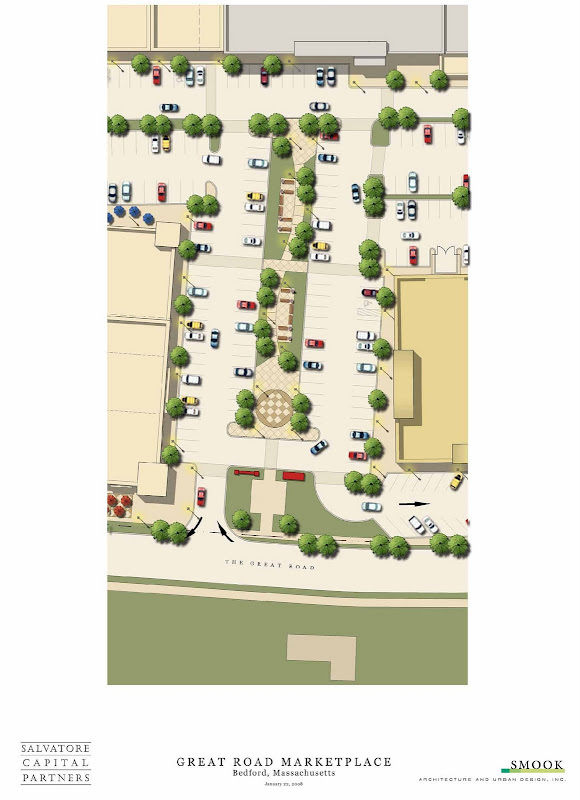 The real challenge is going to be designing the Greenway and sidewalks in a way that people will use them rather than just walking from the parking lot like they do at Wayside Commons in Burlington. I think this will be doable due to the fact that the Bedford shopping center see's a lot more "walk ins" with the nearby residential areas and bike paths. Wayside Commons in Burlington is bordered by Route 128 and is mainly surrounded by large office buildings. Most shoppers walk through the parking lot which I think is partially due to the lack of connecting sidewalks. The other major addition is combining the building where the post office mail sorting facility is with the building housing Luigi's and Bank of America. This enables the possibility of adding a restaurant with some outdoor seating facing the Great Road (click on the top image). If this is done right it will attract bicyclists from the surrounding Bike Paths. One open issue I see is traffic flow. Salvatore Capital Partners has agreed to a traffic study and seems to be working to maximize the traffic flow in and around the site. I'm guessing you would have to upgrade the light to allow left turns in to the shopping center. With the additions there will be approximately 160,000 square feet of retail space. I am wondering how that compares to the Great Road Shopping Center. Overall plan of the Great Road Marketplace. Please click on the image for a much larger view. The design of the storefronts is still underway and has a bit more modern look than the previous design. Depiction of the new store fronts. Please note this depiction does not show where the stores will be located.